Kimberly A. Medina, Esq. was born and raised in Las Vegas, Nevada. She attended the University of Nevada, Reno, where she majored in Journalism. She was also the captain of the Women's Swimming and Diving Team. She is a graduate of Golden Gate University School of Law where she received a certificate of specialization in Family Law and Intellectual Property. While in law school, she was an associate editor for the Environmental Law Journal. 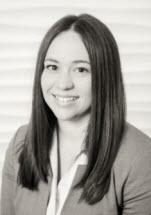 She is licensed to practice law in Nevada and California.